The only reason we have the pests that we do is because of the way we operate. So if we can change the way that we do things, our problems will go away. On May 12 at 7 a.m., a commercial pesticide application team was spraying in a citrus orchard to control thrip, a small insect that feeds on oranges. The pesticide solution contained 32 ounces of cyfluthrin (pyrethroid, EPA toxicity category I), 84 ounces of spinosad (EPA toxicity category III), 18.5 gallons of petroleum oil (EPA toxicity category III), and 1,800 gallons of water. The pesticide was sprayed from three enclosed ground rig applicator tractors that traveled up and down rows and turned around on a dirt road that borders the field. In a neighboring grape vineyard southeast of the pesticide application, 27 farmworkers (23 female) were suckering (i.e., pruning unwanted shoots), lifting, and tying grape vines. Although employers are required by CDPR to notify their workers when they are within a quarter mile of cyfluthrin application, notification of farmworkers in the neighboring vineyard was not required because they worked for a different employer. 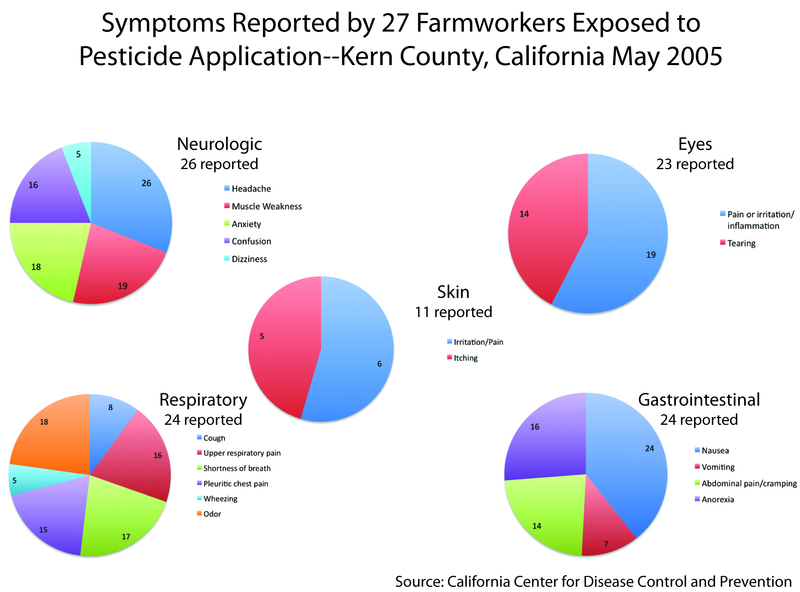 The following chart shows the reported symptoms from the affected 27 farmworkers. Pesticides are used all over this place. It has become part of our life.